This notable house or a replica has been featured in the movies “Charlie’s Angels”, “Body Double” and the televison show “The Simpsons”…as the home of actor Troy McClure. 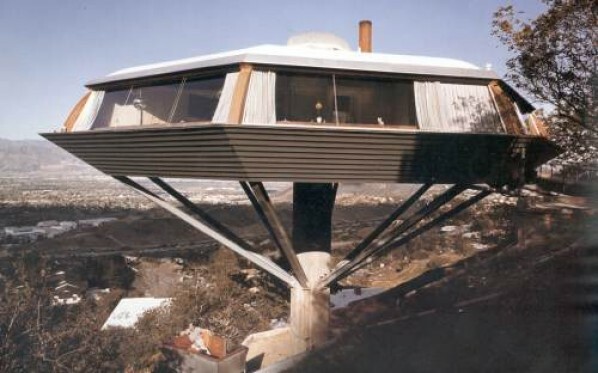 The home was designed by John Lautner as a solution for building on a lot with a 45 degree downslope. The home rests on a 20 ft concrete pedestal, is octagonal in shape and encompasses 2200 square feet of living space. The home is accessed via funicular. The owner-builder was a young aerospace engineer named Leonard Mailin who was given the site as a gift from his father. The home’s 2nd owner, Dr. Richard Kuhn was killed during a home invasion robbery. From 1987 to 1997 the home was rented out for events and the interiors had become distressed. The home’s current owner art book publisher Benedikt Taschen has restored the home and has been recognized for his efforts by the Los Angeles conservancy. Drew de la Houssaye is an associate with THE BROKERAGE Real Estate Group Beverly Hills. Drew specializes in westside luxury real estate, renovations and probate sales. He blogs on Westside real estate, entertainment and local events. If you would like to contact him, he can be reached via twitter, facebook, LinkedIn or email. This entry was posted on Thursday, November 17th, 2011 at 5:07 am	and is filed under architecture & design, notable homes. You can follow any responses to this entry through the RSS 2.0 feed.